NEW YORK (CBS) In a letter obtained by 48 Hours | Mystery, Rudy Guede denies reports that he cleared Amanda Knox of murder in conversations with a fellow inmate. 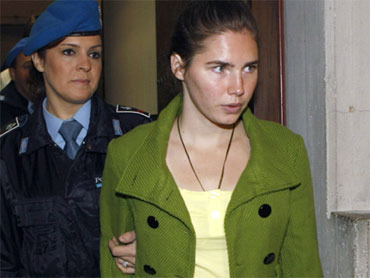 Last week, Mario Alessi, a convicted murderer who was held in the same ward of the Viterbo prison as Rudy Guede, claimed that Guede admitted to him that American Amanda Knox and her Italian boyfriend Raffaele Sollecito had nothing to do with the murder of Knox's roommate Meredith Kercher, for which Guede, Knox, and Sollecito have been convicted - Guede was tried separately. Guede denies clearing Knox and her boyfriend, calling Alessi's statements "the pure invention of a wicked mind," and asserts that Kercher's murder was committed by Knox and Sollecito. As usual in this beloved country of ours, there are many false people, devoted to lying. As there are people who give voice to them without consciously asking themselves whether it is worth giving space to such insinuations. In these last few days I have heard nothing but blasphemous insinuations against me, false rumors, which have done nothing but be reported here and there on television channels even if for those of good sense, they were nothing but the pure invention of a wicked mind. It must be said that what I heard reported by means of the media regarding what was falsely declared by that filthy being called Alessi Mario, whose conscience is nothing but stinky garbage, are only inventions by a sick and contorted mind: fantastic and false declarations by an ogre, which as is known to the whole of Italy, is stained by a dreadful killing in which he took the life of a small human angel. Lying, he is now saying things that I have never said to him, things that are not true in heaven or earth. To his putrified statements, it is my intention to put in writing, that I have never confided in this filthy being, as I have also nothing to confess or say and that everything I had to say I already told the judges and will continue to do so for as long as I'm alive to scream and fight and until truth and justice will prevail regarding these lies. I also did not speak on my own or with others to other detainees about matters regarding my trial and if I had had something to say, do you not think I would have spoken to my lawyers? To use or give credit to that which is a blasphemous statement by a sick mind by an ogre that had no pity towards a child. With this latest show in which myself, my lawyers and my relatives are now used to (...), this latest ogre Alessi. And I hope that Italians and the rest of the world realize what pigs they are having to deal with, pigs who smell of false slime but which despite all this go around showing their face and suffocate people with their stench of falsity. This latest show does nothing else but give me the strength and awareness to fight more than ever to make sure that the truth that they intend to hide is before everyone's eyes. As far as I am concerned, in the full serenity and tranquility of my soul of he who is right and does not pretend to show unjustified suffering, but precisely because he is in the right, I trust in Justice and in the good sense of Italians and finally I hope that sooner or later judges will realize my total non involvement in what was the dreadful murder of the splendid and marvelous girl Meredith, by Raffaele Sollecito and Amanda Knox.